Where do I use my Tombola voucher code? Tombola aims to bring you a fun, friendly and safe environment to bet and play in. With a vast amount of exciting games, you can earn big money while having fun, with huge jackpots to be won every day and great prizes and bonuses available too. 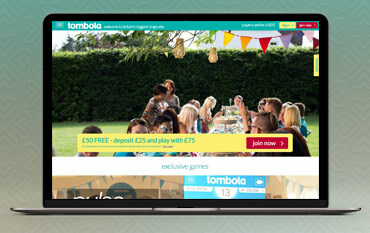 With thousands of players online, Tombola prides itself on being Britain's biggest online bingo site. Simply sign up by clicking the join now button and start playing great games for excellent cash prizes. You could be in with the chance of winning millions. At Tombola you can be in with the chance of winning fantastic prizes. Win bonuses or big cash with bingo, roulette and other fun and exciting games. Prizes at Tombola include anything from a £5 bonus up to £5,000 cash. Join in the fun at Britain's biggest bingo site where over £7 million is won every week, plus get £20 free to get the ball rolling. Play Tombola today and have fun while winning cash. Join now and play their range of bingo games like Bingo 90, Bingo Lite, Bingo 80, Bingo 75 and Bingo 50. As well as other games like Pulse, Tombola Roulette, Battleships, Cinco and Lucky 7. You have five chances to win and there are five jackpots of up to £20,000 to be won in every bingo game! So what are you waiting for - get the app here! What Details do I need's to give to register? Registering at Tombola is quick, easy and free of charge and only takes a few minutes to set up. To register, you will need to choose a username and password, provide your email address and contact number, your date of birth and the answer to a personal security question. If you wish to play games straight away, you will need to deposit money using your debit card, credit card or PayPal account. Deposit money today and you can £20 free to play with. Do I have to be a certain a to play Tombola? Tombola games are only open tot hose aged 18 years or over at the time of registration. Games are open to any eligible person residing in the UK and any country where the games are permitted and lawful. It will be the customer's responsibility to find out if it is legal to play in your jurisdiction. Tombola’s bingo heritage goes back more than 50 years and they’re proud to call themselves Britain’s biggest bingo site. They’ve got all manner of online bingo for you to enjoy whether on your computer, your mobile or your tablet device: shutter board bingo, 1 line and 2 line, full house or progressive jackpots, with anything from £100 to £20,000 to be won. There’s also a great choice in other online gaming, with classics like roulette and virtual slots alongside modern twists like Battleships, Lucky Pick and the Rollercoaster. Your online gaming is safe and secure, and their customer service representatives and chat moderators are all happy to help you enjoy your experience as much as you can. Grab a Tombola promo code and get a good deal when you sign up.